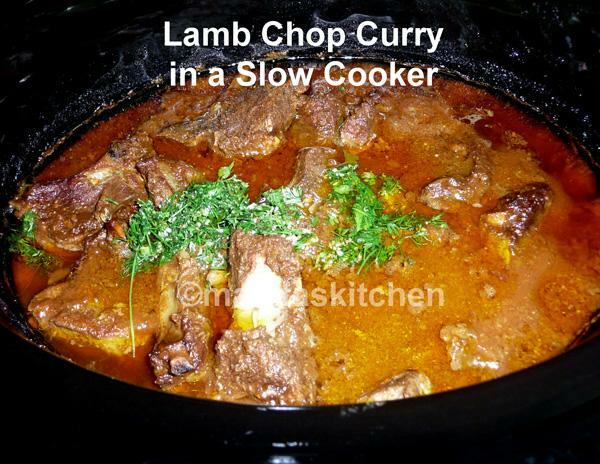 This recipe is suitable for Slow Cooker/crock pot. 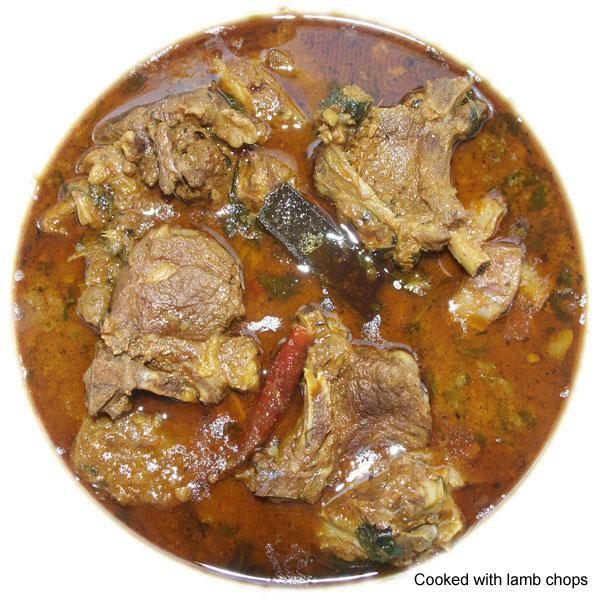 The last composite pictures shows lamb curry made with 2 kg. meat. 1 tsp. black cumin seeds (shahi jeera). Use ordinary one, if you do not have black cumin. *If you do not have these whole spices, use 1 1/2 tsp. Garam Masala instead. Peel onions, ginger and garlic and chop finely or grind in a food processor. If using fresh tomatoes, chop into small pieces or liquidize. Clean, wash and chop coriander leaves and keep aside. Measure whole and ground spices separately. Add cumin seeds and whole spices *, wait until cumin seeds splutter, but not burn. Add onions, garlic and ginger mix and fry until light brown. Ginger often sticks to the pan, so keep stirring or use a non-stick pan. Add all other spices and stir for a few seconds to allow flavours to come out. Add tomatoes and cook strring frequently, until oil separates. Add meat and cook on high flame, stirring frequently until it is well coated and sealed. Cover and cook on medium flame until tender, approximately 25-30 minutes. Cooking time depends on the quality of meat. It can be cooked in 7-10 minutes in a pressure cooker. Cooking slowly on low heat, over a longer period, makes the meat nicer. Add water only if a thinner gravy is required. Usually there is enough water in the meat. Sprinkle garam masala and half of coriander leaves & stir. Cover and leave. Sprinkle rest of the coriander leaves as garnish, just before serving. 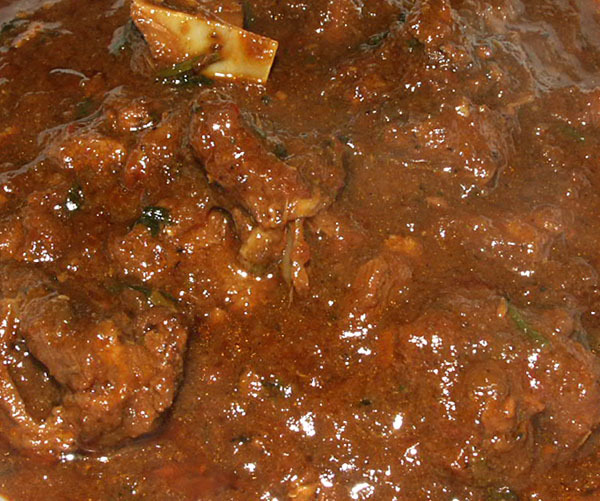 Serve with Boiled Rice and Tandoori Roti. Grind or finely chop onion, ginger, garlic and tomatoes. Place all ingredients, except garnish, in a bowl and mix well. Leave to marinate overnight or for a few hours in an airtight container in the fridge. Cook in slow cooker on high first, until it comes to a boil, then cook on low for 6-8 hours, as per your cookers instructions. Heat oil in a ladle, add cumin seeds. When they crackle, pour on top of the meat. Close lid. Use leg or shoulder of lamb. Ask the butcher to prepare it for you, cutting it into large pieces, with the bones left in, taking out all fat, tendons and membranes. Some supermarkets in UK will slice the meat and bone for you, but you will have to remove the fat and membranes yourself. For a more exotic taste, add 2 tablespoons of double cream or sour cream at the end. Add one bunch of fresh or 2 tablespoons of dry fenugreek (methi) leaves during cooking. Fresh leaves have to be removed from their stalks, washed and chopped roughly. Dry leaves need to be washed in cold water to remove any dust. You can then lift out the clean leaves from the top and add to your recipe. Add a cup full of chopped or tinned spinach. Add potato pieces when meat is half cooked.